This may mark me as woefully out of touch with the kids today, but I do adore books – and charming little independent bookshops which sell them. 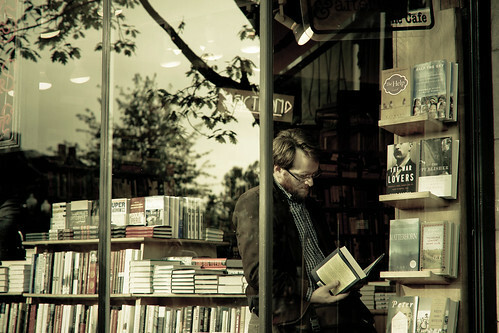 I have no interest in a Kindle or what have you, and I just got back from a vacation where browsing beautiful bookstores was a major activity. While the founders of Politics & Prose and Olsson’s have recently passed away, there remains a vibrant community of book retailing in the Washington area. It may help that we are a very educated, literate group of people, of course. Shannon loves Books for America at 22nd & P. The discounted used books they sell raise money for their literacy projects across the city – so you can stack up $2 book purchases for a good cause. Offerings favor politics, religion, and novels, with a special section for reselling pre-publication manuscripts which, one assumes, fall off the back of a rather tweedy truck in the neighborhood. Probably better known for music than reading material, Katie wants to remind you that Adams Morgan basement shop Red Onion also stocks an eclectic assortment of used books favoring music, fiction, and graphic novels, worth distracting you from pawing over bins of vinyl. Stacked with books in every nook with an older proprietor known for leaving pithy book reviews post-it-noted on certain titles, Capitol Hill Books is charming – and rewards patience. Kirk particularly enjoys that, after 4pm on second Saturdays of the month, the shop sets up complimentary wine and cheese – only adding to the sense that this is the place you will meet your next nerdy-cute boyfriend. 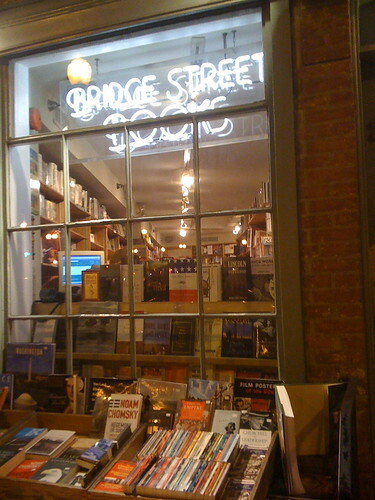 By contrast to Capitol Hill Books, Bridge Street Books is known for offering a well-curated and organized selection. Dave S.’ favorite has a poetry section of local renown (DC perhaps not being a real poetry town), very nice selections in cultural theory, philosophy, and politics/history, and an array of fiction. The shop recently celebrated thirty years in the charming red brick building – hanging on, just a few blocks from the Georgetown Barnes & Noble (double shudder). Famous on C-SPAN has always been good enough for me. The quintessential local bookshop, spread over two big floors, with extensive selections in history, art, food, and every other topic you love. 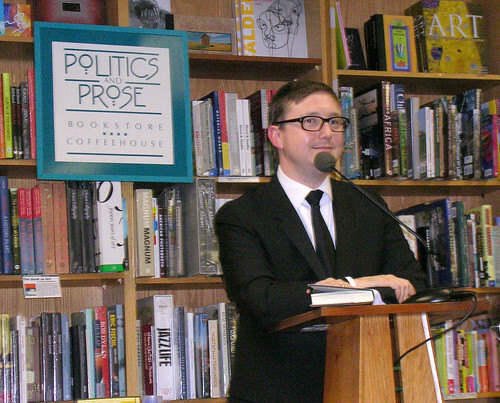 Politics & Prose features regular author events, a cute cafe area for chatting about purchases, and you modern types can even shop online. Honorable Mentions: “Five Favorites” means we pick only five, but there are plenty of lovely shops in the area which could have been included. 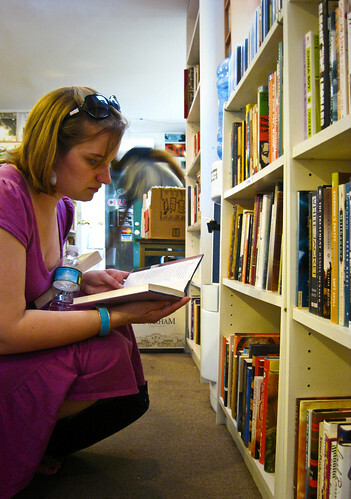 For more book-shopping pleasures, certainly try Second Story Books, Kramerbooks, Bartlebys and other local shops. For more resources about local, independent bookstores, try IndieBound and the Washington Antiquarian Booksellers Association. We live in Alexandria, but don’t mind make making the cross city trek to Politics and Prose. As you know, lots of authors speak there and we’ve been beaucoup times. 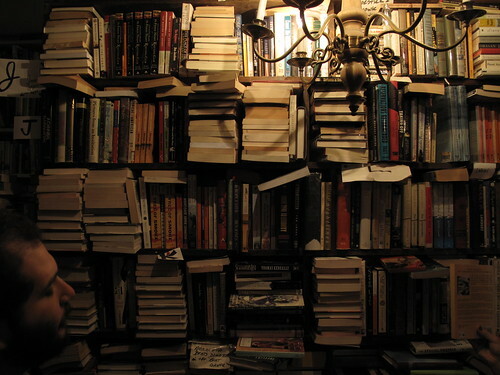 Some have said it is the best bookstore in the country. Hope it hangs on with new ownership but none of us will be totally shocked if it becomes something else.